(ArabNews)– Transport by taxi drone could soon be part of everyday life in Dubai after a Chinese startup told Bloomberg it aims to roll out flying cars in the emirate next year. EHang Inc. is also eying Saudi Arabia as a potential market, it was reported. 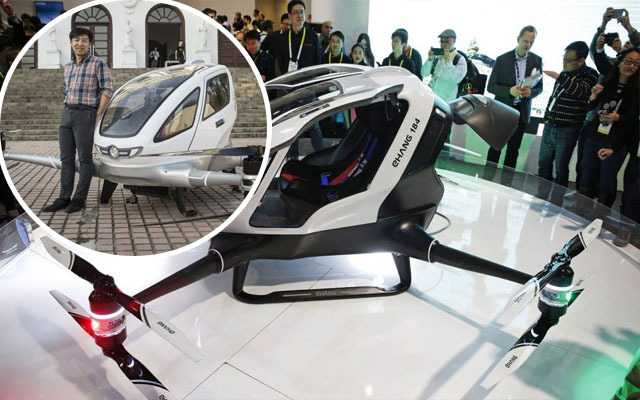 The company has already developed a one-passenger drone and is now working on a larger two-seater model that is currently being tested at the company’s headquarters, located at a disused theme park in Guangzhou, southern China. The E-184 drone, which is powered by four propellors, has a cruising speed of up to 100 kilometers per hour and a flight time of up to 25 minutes before the battery must be recharged. EHang Inc.Passengers in the fully-automated drones select a pre-programmed flight path to reach their destination then sit back and enjoy the view. The company hopes to roll out the taxi drones in Dubai as early as next year, subject to regulator approval, and plans to embark on an ambitious mass production plan to reach markets in Saudi Arabia, Singapore and several European cities. In February, EHang announced its partnership with the Dubai Roads and Transport Authority with the shared aim of developing the world’s most intelligent transport system. Powered by electricity, it is made with 100-percent green technology and is designed to land immediately at the closest possible location in case of malfunction.